One of my favorite things about baseball are doubleheaders. Honestly, there is nothing more exciting then knowing that you can make up two games in one day. Even though the Mets split the only other doubleheader this year (May 25th vs D-Backs), almost every doubleheader seems to go this way: dramatic finish in game 1, a very entertaining match all around, down to the wire esc game, then in game 2, the team that won the day session jumps out to an early lead and the game is a bunch of goose eggs from that point. The team that wins the first game has a HUGE advantage over the opponent in game 2, momentum and psychology are very important in a game like baseball, and it “doubles” during “double”-headers. 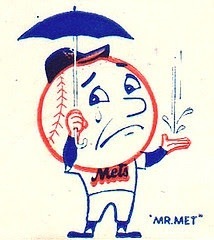 Regardless, the Mets play two in Washington tomorrow at 1pm and 7pm respectively, Gee during the day, Wheeler at night.